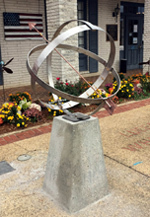 The armillary sundial is part of the statue Hercules Upholding the Heavens. The statue portrays the ancient Greek hero Hercules performing the eleventh of his twelve labors, holding the heavens on his back for Atlas. The bronze sculpture is 1,650 pounds and over 10 feet tall. In 1917 Paul Manship was asked by Charles Schwab (Bethlehem Steel) to create this sculpture for his garden at his newly completed mansion. 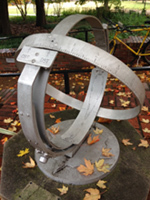 The equatorial dial made of aluminum operates on a unique principle. 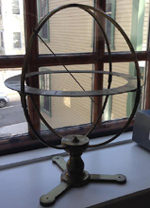 The equatorial time ring is allowed to rotate. 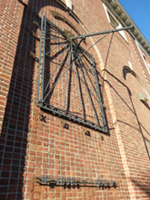 Fixed to its co-rotating noon hour meridian ring is a plate with the analemma, extending +/- 23.5 deg from the equator. At top of the equatorial ring is a small hole allowing sunlight to make a spot on the analemma plate. The whole assembly is rotated until the sunlight spot falls on the analemma (with monthly marks to avoid ambiguity). One tells time using 5-minute time marks on the top of the equatorial ring read by one of two indicators either as central standard or daylight savings time. 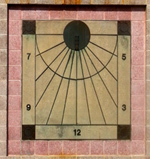 This horizontal dial was commissioned by the District of Columbia Department of General Services for the newly renovated River Terrace Educational Campus. 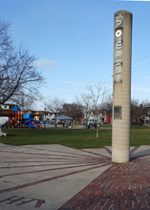 The mosaic dial is installed within a 20 ft diameter concrete plaza. The dial face is a beautifully colored spectrum of Italian Piccolo porcelain 1-inch mosaic tiles encompassing a circle 8 ft in diameter. Embedded in the mosaic chapter ring are 7-inch aluminum Arabic numbers marking the hours from 6am to 6pm and just within are letters marking the cardinal points. 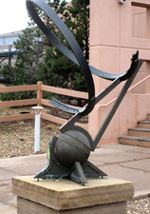 The aluminum gnomon is 4 ft. long and 2.83 ft tall.